First on Thursday night, Kent Arment won his second career NLRA feature at the Norman County Raceway in Ada, MN. The win was his first with the NLRA since June 26, 2004, when he won at the Brown County Speedway in Aberdeen, SD during the series only visit to the speedway to this date. The main event got off to a rocky start with multiple cautions before a lap could be completed. Once action got underway, Dustin Strand, driver of the No. 71S Q&Z Plumbing & Heating Millenium jumped out to the point and held the lead, including after restarts on laps seven, and twelve for Bill Mooney in the No. 2 freehearingtest.ca Rocket, and Brian Bernotas respectively. After a lap eighteen caution for Troy Schill, and his No. 11 Forks Finest Auto Body Victory Circle, June 19th Ada winner Zach Johnson took the lead from Strand on lap 20. Enter Kent Arment. Arment, who started thirteenth, took second from Strand on lap 22, and the lead from Johnson on lap 25. Arment leads the rest of the way for the win. Strand fell back to third, but regained the runner-up spot from Johnson on the final lap. Johnson finished third, Pat Doar and Jeff Provinzino finished fourth and fifth respectively. Brad Seng, driver of the No. 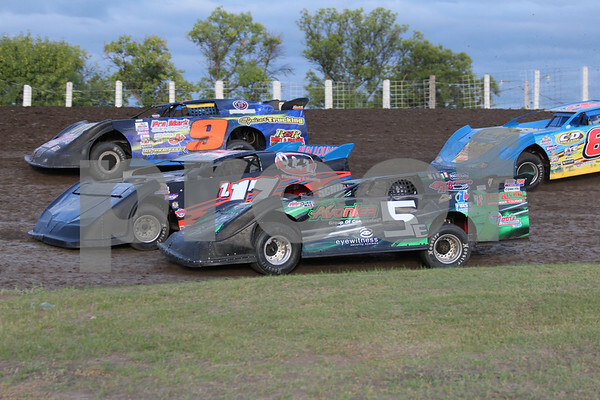 12S S&S Transport Mars MB Custom came home sixth, Cody Skytland, Jeremy Keller, Joey Pederson, driver of the No. 7P Dahlstrom Motors Mars MB Custom, and John Kaanta rounded out the top ten. Strand, Seng, Skytland, and Doar were heat race winners. 26 of the 29 cars that signed into the pits started the 30 lap main event. On Saturday night, Mike Balcaen, driver of the No. 10 Northstar Canada Victory Circle, became the second NLRA series regular this season to score his 20th series victory at the Jamestown Speedway in Jamestown, ND. The victory tied him with Brad Seng for second on the NLRA series all time wins list, six back of the late great John Seitz. The win was also his 204th career main event triumph, and his second win of the 2013 season. Balcaen took the lead at the start, but Pederson used the top of the track to motor past Balcaen to lead the first lap. Balcaen eventually reeled in Pederson, and took the lead from on lap 13 of the 25 lap event and never relinquished the spot. Jeremy Keller took second from Pederson, and kept the spot for the remainder of the race. Pederson finished third, while Thursdays' winner Kent Arment finished fourth after starting 12th, also collecting the hard charger award. Hank Berry of Sidney, MT completed the top five. John Kaanta, Brad Seng, Minot's Allen Kent, Dustin Strand, and Chad Becker rounded out the top ten. Pederson, Keller, Kaanta, and Balcaen won their heat races, while Mitch Johnson won the B Main. 32 cars were in attendance, the NLRA's second best car count of the season thus far. Zach Johnson, driver No. 73 of the Midwest Grain Systems Pierce, won his third NLRA feature of the 2013 season Sunday night at the Buffalo River Race Park near Glyndon, MN. The win was also Johnson's 10th NLRA series victory tying him with Ricky Weiss and Jeff Wildung for fifth on the all time wins list. Johnson took the lead from Dustin Strand for the second time during the three race stretch, this time completing the pass on lap 17, leading the rest of the way. Strand was the runner up, his 14th runner-up overall this season. Brad Seng finished third, while Mike Balcaen came home fourth. John Kaanta was worth the price of admission alone. After failing to finish his heat race, Kaanta drove his No. 85 machine from the 24th starting spot to fifth by the end of the event. Donny Schatz, who entered the night $150,000 dollars richer after his winning his seventh Knoxville Nationals title the night prior, finished sixth, Joey Pederson, Cole Schill, driver of the No. 44 Quaker Steak & Lube Rocket, Cole's uncle Troy Schill, and Last years' winner Shane Edginton rouned out the top ten. Edginton, Matt Aukland, Strand, and Seng were heat winners of the 25 car field. Dustin Strand increased his lead over defending series champion Brad Seng in the NLRA season point standings to a 52 point advantage. Joey Pederson sits in the third spot, while Mike Balcaen, and Bill Mooney round out the top five. Steve Anderson driver of the No. 9 Hi-Per-Flex Panel Systems Pierce stands in sixth, with Troy Schill in seventh, Cole Schill in eighth, Billy Michaelsohn, driver of the No. 8 Dave's West Fargo Tire Rayburn ninth, and Zach Johnson rounding out the top ten. NLRA action continues Friday at the River Cities Speedway in Grand Forks, and Saturday night at the Devils Lake Speedway near Doyon, ND.